That said, I NOW understand what all the rage is about with Rick and Morty. It’s mature, immature, dark, funny and totally out there bonkers weird. Rick and Morty is my kind of humor. If you’re a huge fan of something, you need every toy and collectible you can get your hands on. I have the Funko Portal Gun, the Loot Crate mini figure dioramas (Rick flipping the double bird is hilarious), and a figure of Scary “Aww B$@ch!” Terry. A good start, but like me eagerly waiting for Rick and Morty Season 4 to drop, I need more. Enter Kidrobot, the designer toy company whose motto is bringing “art to life”. 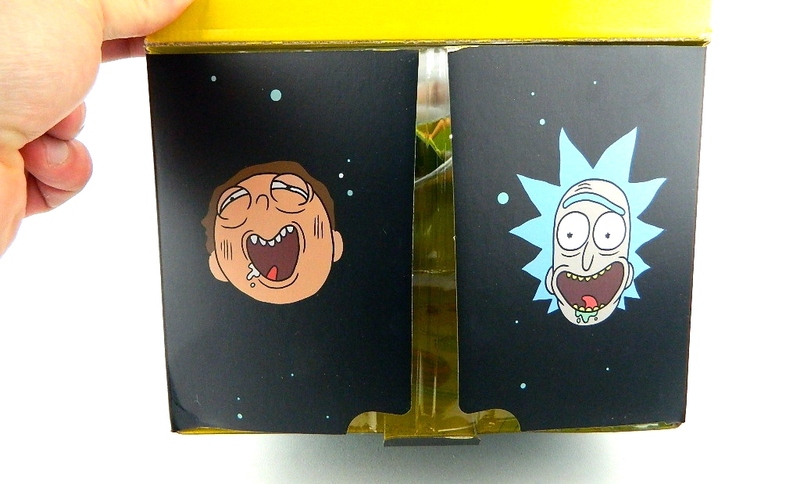 For Rick and Morty, Kidrobot has dropped numerous collectibles, including enamel pins and blind boxed mini vinyl figures. 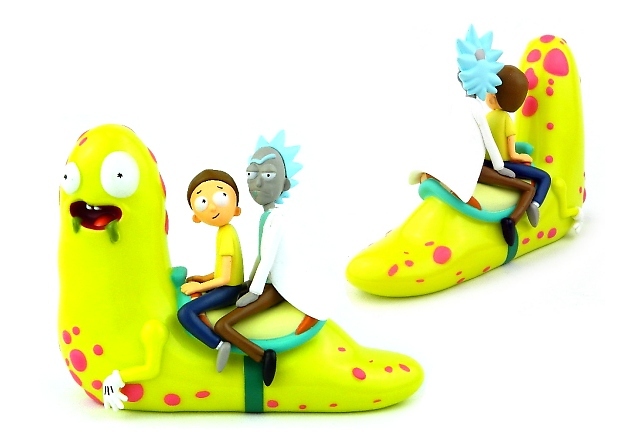 However, Kidrobot’s nicest Rick and Morty collectibles are their designer vinyl figures. Exclusive to Hot Topic stores, Kidrobot’s first collectible vinyl depicts Rick and Morty doing what they do best – portal jumping while trying to stay alive. This piece does an amazing job of encapsulating the animated series in a tight 7-inch diorama setting. One side features our comic duo scrambling to get through the portal: Rick gripping his portal gun (and apparently reaching for some booze), with his young cohort screaming in mad terror. 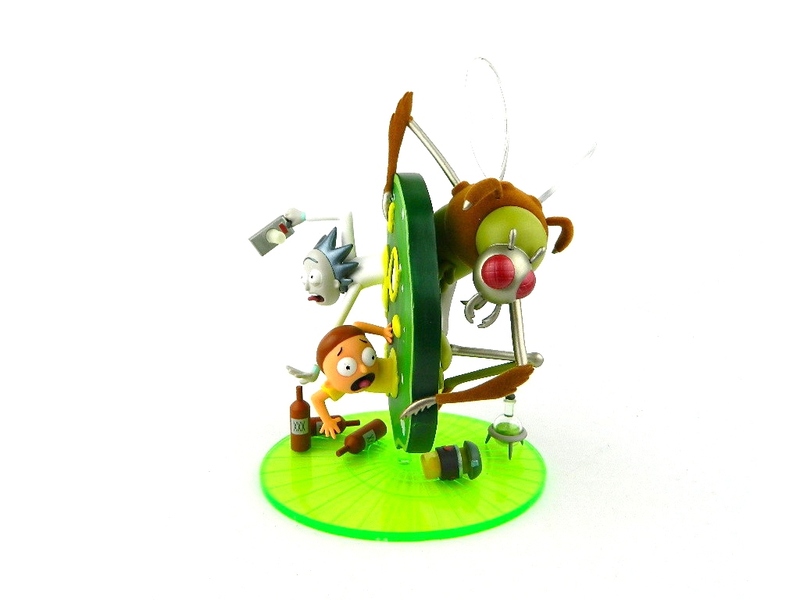 The flip side shows what Rick and Morty are running from: a Gromflomite, a species of insectoid aliens originating from Gromflom Prime. Aside Kidrobot’s bold color usage, I really like how different materials are used, such as the flocking on the Gromflomite and the translucent lime green plastic base. It all comes together to create a very dynamic display piece – a wonderful collectible for Rick and Morty fans new and old. 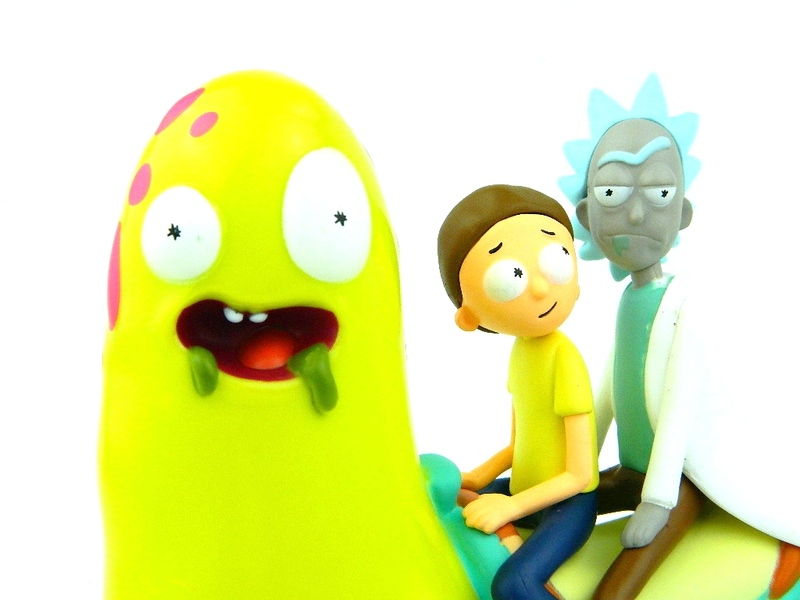 Where Kidrobot’s first vinyl acts as an excellent introduction to Rick and Morty’s animated antics, their second piece – the Slippery Stair – dives much, much deeper into Rick and Morty lore. Appearing in the zany episode Meeseeks and Destroy, Slippery Stair is a slug-like character that offers to take Morty and Rick down the Giant’s stairs for 25 Shmeckles. 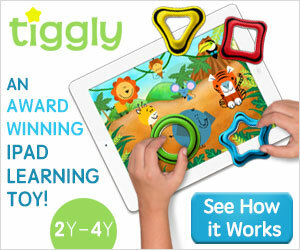 Does that make any sense? Of course not! It’s totally insane. And that’s precisely why I like Rick and Morty – and in particular, this 7-inch vinyl. It perfectly captures the psychedelic nature of the show. 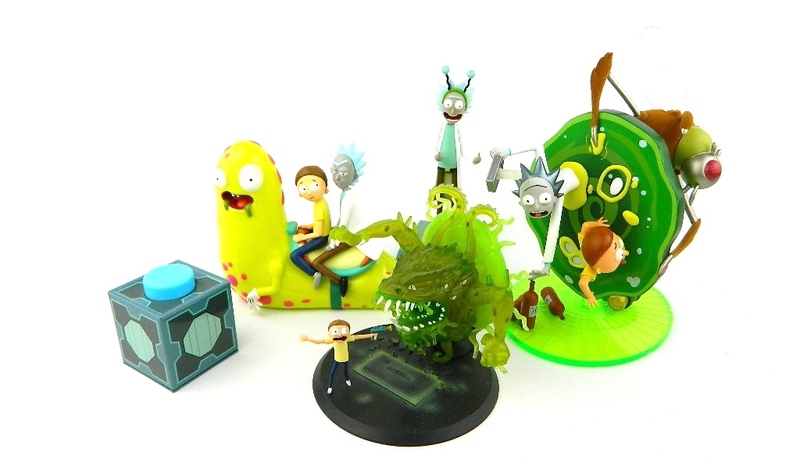 There is no shortage of Rick and Morty collectibles, but few as nice as Kidrobot’s collectible vinyl figures. As a Rick and Morty fan, you owe it to yourself to own at least one to show off your fandom. If you’re new to Rick and Morty – don’t be a Jeff. Watch the first three seasons now and get turned on to one of the craziest shows ever created. And then brace yourself for season 4… it’s gonna be a wild ride.